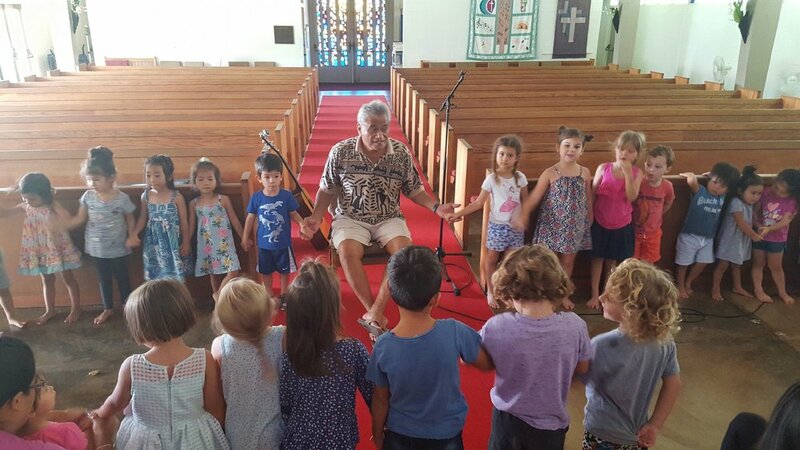 The children have fun during our Keiki chapel with Rev. Piula Ala’Ilima. Video of our Preschool Graduating Class of 2018! Wesley Children's Programs is a caring, nurturing, early childhood education center. Sponsored by the Wesley United Methodist Church, the Wesley Children’s Programs provide part time childcare and preschool for children ages 6 months to 5 years old and afterschool and seasonal care for children in kindergarten through 6th grade. LIMITED SPACES AVAILABLE! PLEASE CALL FOR MORE INFORMATION! Extended care available for children 2 years and older. Full Time 9:00 a.m. to 2:00 p.m.
Full Time 9:00 a.m. to 5:30 p.m.
Comprehensive Fee for all children in the program is $100.00 Non-refunddable (supplies, excursions, and t-shirts). Hours are 9 am - 2 pm. We have extended care till 5:30 pm, for additional charges. Extended care needs to be scheduled in advance. Your being late makes a staff member late in leaving. Be on time. If you are picking up your child at 2:00 pm, please be on time or you will be charged for extended time. If you would like more information about our programs please fill out the form. Someone will get back to you shortly. Thank you for taking the time to look into Wesley Preschool!